Comandra umbellata.© 2003 Janet Novak. ct-botanical-society.org.. (Accessed 5/2014). 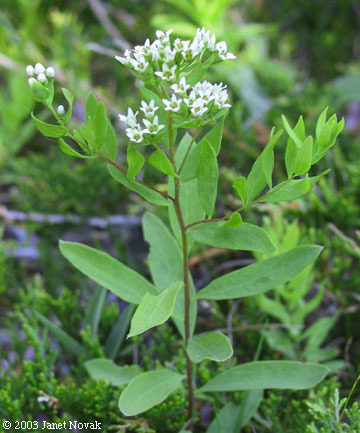 Comandra umbellata is a perennial, partial root parasite (hemiparasite) to 40 cm tall, stems leafy, mostly unbranched, colonial from rhizomes. Leaves alternate, oblong, to 5 cm long, conspicuously net-veined, thin, pale below. Flowers small, greenish-white, calyx 5-parted, bell-shaped, lobes 0.3 cm, no petals (Newcomb 1977), in branched clusters, blooms May-June. Fruit dry, to 0.6 cm wide. Habitat: Dry to moist open woods or fields, sandy, acid soil.